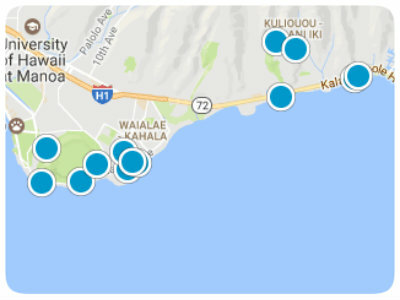 Oahu has gated communities but you have to know where to look to find them. Hawaii Loa Ridge is probably the biggest and most well known luxury gated community on Oahu. Almost all the homes on this ridge enjoy wonderful ocean views. Also, within Hawaii Loa Ridge is another gated community called the Pointe. Homes for Hawaii Loa ridge start in the $1.2 million range and go up to over $10 million. Waialae Iki 5 at the top of Waialae Iki across from Waialae country club enjoys wonderful ocean views as well and has the advantage of being a little closer to town(Honolulu). Just next door to the east of Waialae Iki 5 lies Kahala Kua consisting of 120 homes atop part of the same ridge that Waialae Iki 5 is located on. For the most part all of the gated communities mentioned above enjoy cooler weather due to their increased elevation allowing for cooler temperatures and have a better chance of catching the tradewinds. If you don’t like the idea of driving up and down a hill everyday Black Point near Diamond Head with its private oceanfront saltwater pool or Nohona Kahala (pictured above) hidden near Kahala mall might be a better option. Queen’s gate in Hawaii Kai is another option as well.